The Figue de Barbarie goes by many names: the prickly pear, Karmous, Handia, Opuntia ficus-indica or simply, and perhaps most obviously, the Fig. However, whatever you call it, it is delicious. The Figue de Barbarie, as we shall call it for now, is a popular summer fruit throughout Marrakech and, between May and October, it is sold throughout the Souks and the streets of Marrakech. Although it originates from Mexico, the Figue de Barbarie now grows up in the wild areas and uplands of Atlas Mountains and in the sheer areas in Morocco. The Fig is especially popular when the Islamic month of Ramadan falls between May and October as it provides a much-needed source of potassium whilst quenching the thirst of many Marrakchis. 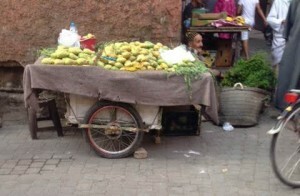 However, this fruit is not just for eating: many Moroccans also use it as a cosmetic product. It is believed that the juice from the fig nourishes skin and even helps repair damaged skin. So, whether you eat it or rub it on your skin, why not book a trip to Marrakech to enjoy the Figue de Barbarie? This entry was posted on Thursday, July 24th, 2014 at 11:44 pm	and is filed under Marrakech, Photo a day. You can follow any responses to this entry through the RSS 2.0 feed. Both comments and pings are currently closed.